Linkam Scientific Instruments reports on the research of Dr Jamie Wilkinson of the Natural History Museum in London, where he uses temperature-controlled microscopy to characterise mineral deposits. Dr Jamie Wilkinson is a Research Leader in Mineral Deposits in the Department of Earth Sciences at the Natural History Museum, London. He is a member of the London Centre for Ore Deposits and Exploration (LODE) Research Group, a joint initiative between the Natural History Museum in London and the Department of Earth Science and Engineering at Imperial College London. The Group carries out research on the mineralogy and geochemistry of ore deposits to improve the success rates of mineral resource discovery and provide solutions to reduce both the environmental impact and energy use of resource extraction. Their work combines both seeking practical solutions to exploration challenges and improving the understanding of the processes by which ore deposits form in the Earth's crust. Dr Wilkinson has worked with various Linkam stages for more than 20 years starting with his PhD research work at the University of Southampton. 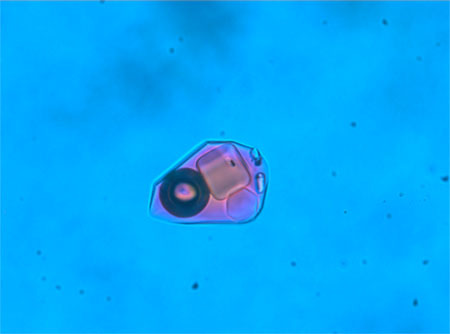 The temperature stages are used to study fluid inclusions - microscopic droplets of liquid that can be trapped inside growing crystals when they form in the Earth. These are typically just a few tens of microns in size, thus requiring microscopic methods for their investigation, and may have formed millions or even billions of years ago. By freezing and heating these inclusions, it is possible to obtain information on the composition, density, temperature and pressure of entrapment of the fluid - information that provides critical constraints on the conditions of crystal growth. In ore deposits, this information can tell a researcher about the temperature at which the ore minerals formed, their depth of formation beneath the Earth's surface and something about the fluid composition, in particular how salty it is, and also whether it contains dissolved gases like methane or carbon dioxide. Data like this can be critical in distinguishing between different mechanisms for ore formation. Dr Wilkinson says: "I have become more and more impressed with the Linkam family of temperature-controlled stages. They provide precise and accurate measurement capability, are designed with a small thermal mass so respond quickly and require small temperature calibration corrections. Not least is their ease of use (particularly where inexperienced undergraduate students are concerned). All are equally important to us." An example of Dr Wilkinson's research is presented in a paper that documents data gathered over a number of years to demonstrate a new method for the estimation of salinity in aqueous fluid inclusions. In discussing the design of the stages, Dr Wilkinson said: "The thermal masses of the stages (heating block and sample holders) are small and hence thermal equilibration rates are clearly very fast. This is evidenced by the virtually immediate response of an inclusion to a small step in temperature when close to a phase change such as final ice melting or CO2 phase homogenisation. Linkam's stages were ideal for this work."